Visual Studio Code>Other>Micropython IDENew to Visual Studio Code? Get it now. Flashing Micropython firmwares into devices, current support flashing ESP8266, ESP32 boards using esptool.py. Generate new project with supported files. Support send project files into board. Support Serial Monitor for debugging your scripts. This extension required python with pip (python package installer) installed on your system operation. If you do not have already installed Python, you can downloading from the official site. You can use python 2.x but I'm recommend using 3.x will better. First, you need to generate new project by open Getting Started menu. To open Getting Started... menu, you can press shortcut ⌘ + ⇧ + P keys, then find from commands list with keyword: Micropython: Gettings Started. 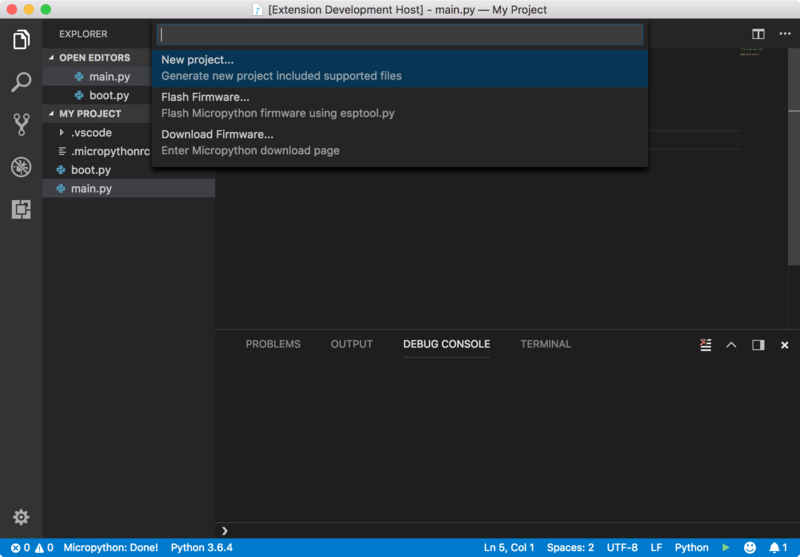 You can integrate with existing project by creating .micropythonrc file into your project root directory. This file stores build and debug settings for your project. You can run project by move to script file from prject directory. From VSCode status bar, press ▶ button in the bottom right. Or using Run command from commands list. To stop running script, you can stop by press ◼ button in the bottom right. Or using Stop command from commands list. From Getting Started menu, select Flash Firmware then follow the step-by-step instructions.